On October 19, 2016, artists from across the country will come together for SUPERFIERCE, a traveling art exhibit by female artists paying it forward. 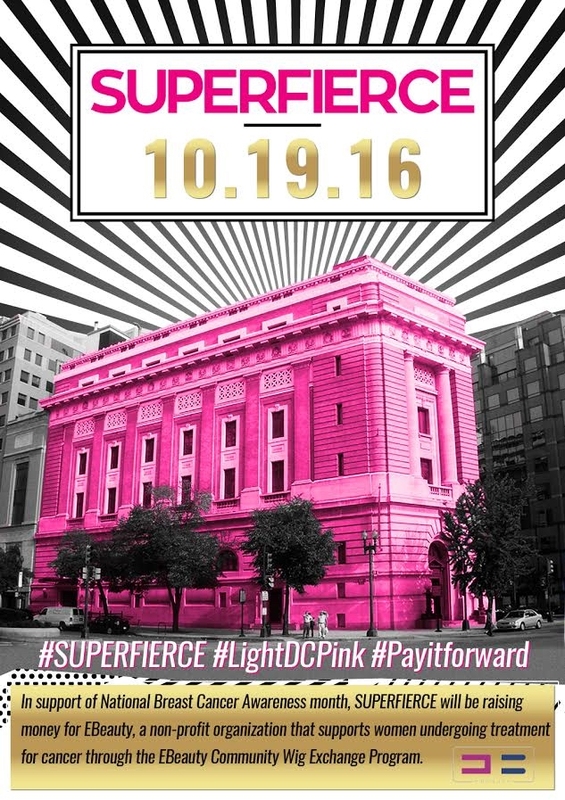 The inaugural event, SUPERFIERCE DC, will take place at 6:30 pm in Washington, D.C. at the National Museum of Women in the Arts (1250 New York Ave., N.W.). Save the Date for SUPERFIERCE DC. Highly acclaimed artists Lana Gomez and Ashley Longshore and DC’s Maggie O’Neill, Dominique Fierro and Violetta Markelou, will showcase their artwork at the event. Additional artists to be announced this month. In support of Breast Cancer Awareness Month, SUPERFIERCE will be raising funds on behalf of EBeauty, a local non-profit organization that supports women undergoing treatment for cancer through the EBeauty Community, Wig Exchange Program and other charitable initiatives. “As a two-time breast cancer survivor, I know first hand the kind of struggles women go through when fighting to win the battle against this disease,” said Carolyn Callahan Keller, Founder of EBeauty.com. “The entire concept behind SUPERFIERCE represents bravery, female empowerment and paying it forward – values we share in our EBeauty Community. We are thrilled to be partnering with Maggie and her team of SUPERFIERCE women to kick off this amazing program.” To celebrate EBeauty and Breast Cancer Awareness Month, the National Museum of Women in the Arts will be illuminated pink on October 19th. SUPERFIERCE is a traveling art exhibit hosted by female artists paying it forward. To purchase tickets, please visit www.superfierce.org.